The feast consists of an amazing take on a traditional six course Christmas feast. 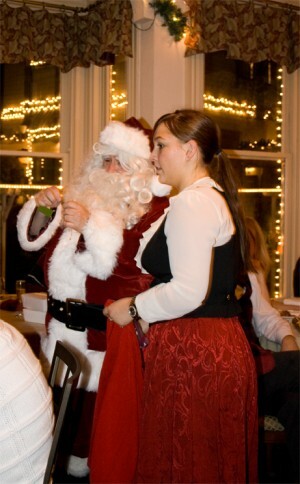 A fun and energetic group of festive Carolers in Dickens Christmas costumes entertain all as they stroll through the restaurant singing traditional Dickens Christmas carols. Keep an eye out for old Scrooge as he is sure to be "Bah, humbuging!" his way through the evening. You can even look forward to a visit by ol' Saint Nick as he brings presents to kids one to ninety two. The Dickens' Christmas feast in Ashland is a longstanding tradition that both locals and people visiting Ashland from all over the world have come to love as part of their yearly holiday tradition. $67.50 per person with tax and gratuities included. A $30 per person deposit is required with a guaranteed number for your party. Dinner begins at 6:30 each evening. We recommend arriving by 6:15.